Reading Plastic Machining & Fabrication offers custom plastic fabrication NJ companies count on. Since the 1950’s, we’ve built our company on craftsmanship, precision and quality. Our parts can be found around the world, in labs, hospitals, telecom equipment, aircrafts, military defense systems and beyond. We are the source of performance parts guaranteed to deliver for you. Just a short drive away in Reading, Pa., we’re an ideal choice for companies in the Tristate area. Find out more about our capabilities below. Our custom fabrication services will transform your machined parts into finished products. Capable of complex bending and threading, our fabrication team ensures your parts are assembled and ready to go for you or your customer. Using hot stamps, silk screening, stickers and other methods, we can brand your fabricated parts with your name or logo for a custom touch. 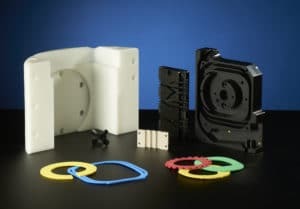 In addition, we’ve worked with virtually all specialty plastics available today, from PEEK to VESPEL to various ESD materials. To avoid costly missteps with expensive materials like these, you’ll want our expertise on your side. As you can see, we’re capable of handling your project from start to finish, from plastic selection to CNC manufacturing to fabrication. We are a one-stop shot for precise parts. Reach out by phone at 610-926-3245 or at site2@ReadingPlastic.com to talk to us about your project. You can also fill out our quote form online. We can’t wait to start talking solutions and get started meeting your plastic fabrication needs.